According to various reports, pop singer Justin Bieber bought a Gulfstream 650 private jet, also known as a G6. Although he may be only one fifth of a billionaire, it is enough to purchase a $60 million private jet, or at least a shared interest in one. He posted pictures of himself on the jet on Instagram. Here is a gift that all billionaires might want to buy for themselves. 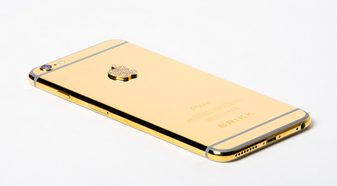 It is the Lux Apple iPhone 6 Plus from BRIKK.com, which is finished in two layers of 24K yellow gold. In addition, it has a diamond Apple logo, made with 1.68 carats of DE color and VVS1 clarity brilliant diamonds. The phone has 128 GB of memory and is GSM unlocked for world wide use. The Lux iPhone is made in Los Angeles, California. If you don't like yellow gold, the company also has a pink gold phone and a platinum phone. The price for the Lux iPhone 6 Plus is a reasonable $11,895.00. It can be ordered from BRIKK.com. The time to start shopping is now. Whether you are looking for gifts for yourself or someone else, there are plenty of moderately priced items to choose from for the billionaire. Get them now before they are sold out. 1. How about a nice home in California? Graceland West in Palm Springs was formerly the home of Elvis Presley, Ray Kroc, and Frankie Valli. Price is only $2,590,000. 2. I think it's time for a Men's Zenith Academy Minute Repeater Automatic Watch. Price only $110, 720, marked down from %173,000. 3. Haven't you ever wanted your own private island? How about the 222 acre Cave Cay Island in the Bahamas, for only $110,000,000. 4. Jewelry always makes a great gift. How about a Platinum Cushion Cut Blue Sapphire and Round Diamond Pendant for only$96,626, marked down from $120,782, with a list price of $241,564.